Road Respect, of the Northumbria Safer Roads Initiative, have released their hard-hitting No Look, No Touch, No Phone campaign video on social media and YouTube. 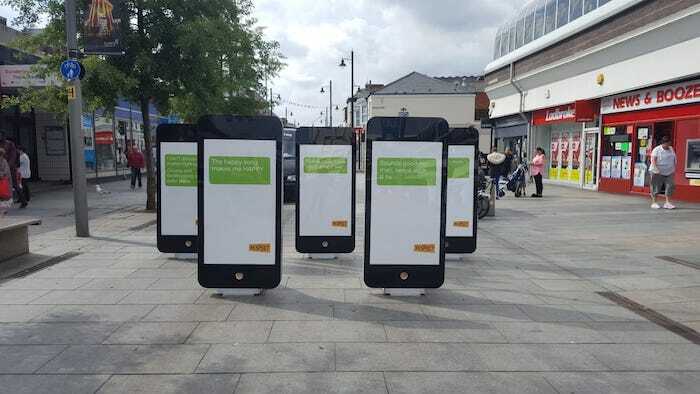 The multi-media campaign stretched across 6 months, utilising ‘Last Texts’, messages sent by drivers who unfortunately died as a result of using their phone at the wheel. It started with a tour of the North East which featured bespoke made 6 feet tall phones with one of these last texts on the front of each. The Last Text Tour visited key areas including Northumberland Street in Newcastle, Market Square in Sunderland and King Street in South Tyneside. The messages were sent either via text or other social media platforms such as WhatsApp, Facebook Messenger, and also included Tweets and Facebook updates. There were plaques on the back of each of the phones explaining how each driver crashed, who they were texting and why they were doing so. The Last Texts formed the basis of the No Look, No Touch, No Phone campaign, with the messages also displayed on billboards and petrol station forecourts around Newcastle and Gateshead in high footfall and dwell time areas. They were then distributed to local pubs and bars in the form of beermats and posters to attract as much attention as possible. The installations tied in digitally with the Road Respect social media channels which featured the texts in short, easily digestible video format, with video footage of the events also curated to amplify the reach of the campaign to both digital and physical worlds. These posts and videos went viral, achieving hundreds of thousands of impressions and engagements. The visual nature of the phones/last texts acted as a hook for the public, and once people read how mundane and every day the texts they were sending were and the outcome of such behaviour, the reality of the dangers of texting behind the wheel hit home. Feedback during the events and on social media were incredible, and the campaign resonated with drivers and passengers alike and ultimately worked towards encouraging behavioural change behind the wheel.